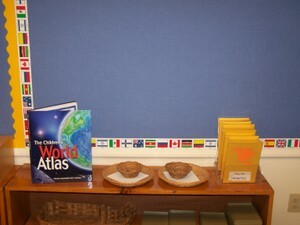 One of the things that I love so much about Montessori education is its emphasis, from a very early age, on geography. I feel that this was a very neglected area in my education. And to be perfectly honest, my knowledge of geography increased tremendously when I became a Montessori preschool teacher. This would probably surprise people who aren't familiar with Montessori education. After all, most preschool programs do not teach geography. Montessori education helps children develop an understanding of their place in the universe. In fact, Montessori education is often called a "cosmic education." To this end, children are presented with the big picture first. This can play out in the pre-primary classroom in several ways. One thing that I like to do early on in the school year is to teach the children the "continents song" at line time. The version of this song that I have used in the past is as follows. The tune is "Freres Jacque." While singing this, I have the continent map in front of me (see photo below) and I point to the various continents as we sing them. 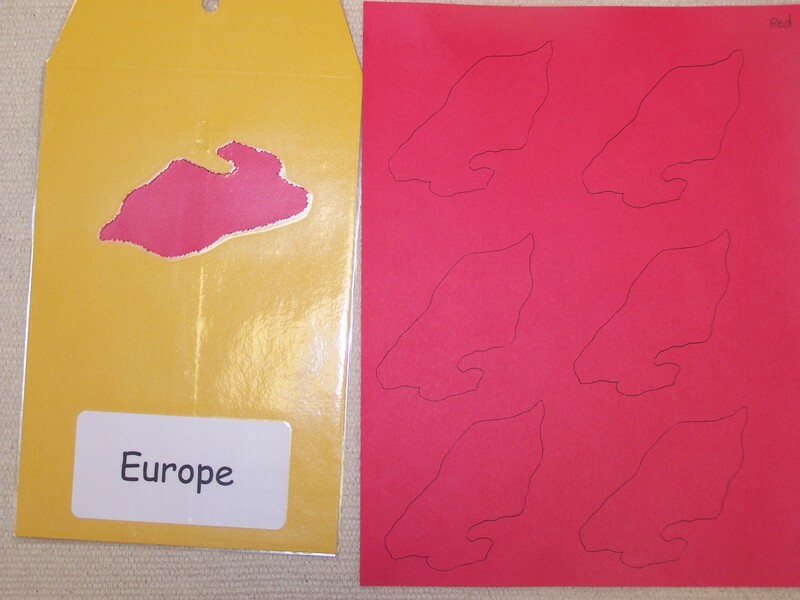 Once children have been introduced to the continents through the continent song, they may choose to make their own continent map. Using a sheet of white oaktag for the background, they use a plexiglass circle the exact shape of the hemispheres to trace the two hemispheres on blue construction paper. They then cut these out using scissors (or pin-punching, more on that below) and glue them to the white background piece. Then they are ready to punch out their first continent. 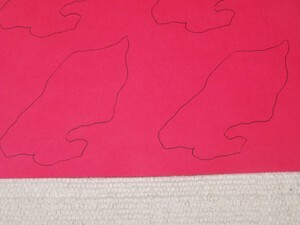 To prepare this work for the shelf, I began by tracing each continent piece on plain white paper. I tried to get several on my master sheet. Then I copied the master sheet onto copy paper the same color as the continent piece from the continent map puzzle. The photo above shows my copies of Europe in red. 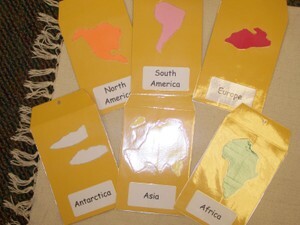 Then I pin-punched one of each of the continents out and glued it to the front of a manilla envelope. I also adhered a sticker with the name of the continent on the front. Then I laminated the whole envelope and slit open the opening in the back. The next step was to cut apart the continents on the colored paper (but not cut around them) and place them in their correct envelopes. Here are some of the completed envelopes. I apologize for the terrible flash glare. And don't worry, my Australian friends, I haven't forgotten your continent. I just need to buy another package of envelopes to finish this work. I already ruined one whole set of envelopes trying to do this a different way.......a long sad story that I will spare you of!! Here is the top of my Geography shelf so far. Just to the right of the shelf is the map stand. You can see two little baskets for pin-punching and a divided holder for the continent envelopes. 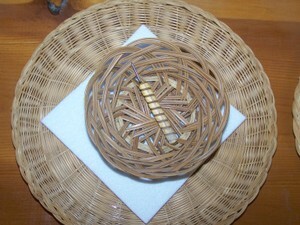 Here is a close-up of the pin-punching baskets. To do this work, the child takes the whole tray/basket and chooses the continent from the envelope that they want to punch out. They then take all these materials to a table. The felt pad is placed flat on the table. 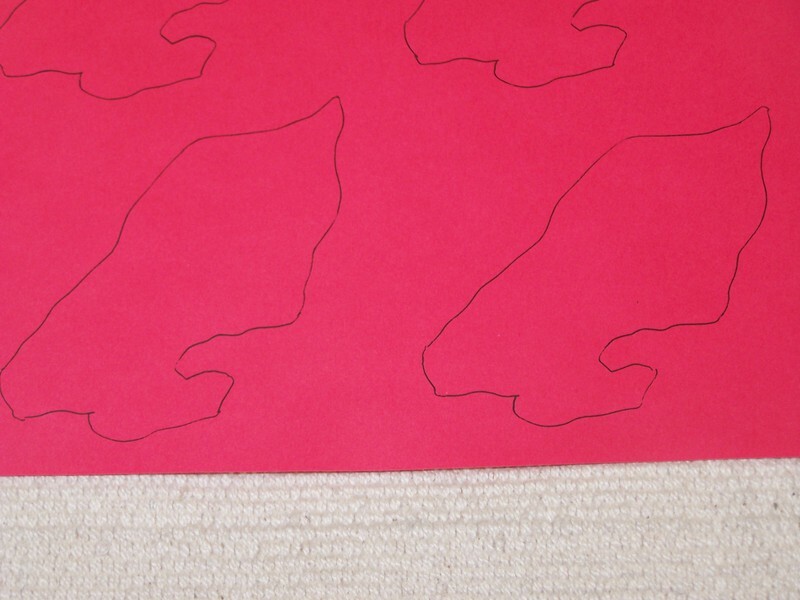 The traced continent is placed on top of the felt. Then they use the puncher tool to punch holes along the outline of the continent. This perforates the continent so it can then be "punched" out of the paper surrounding it and ultimately glued onto their map. I think it is so very, very cool for young children to make their own maps. What an amazingly hands-on way to learn geography. I can only imagine how much richer my knowledge of world geography would be now if I had had such experiences as a child. I want to make a few more points about this work. First, I realize that some people may think that the child should be allowed to take the actual puzzle piece and trace around it for themselves instead of having it already traced to punch. And I agree that that would be ideal. However, realistically, it is VERY difficult for very young children to hold a puzzle piece and simultaneously trace around it. In fact, when I did it to make the master copies, it was kind of hard. And I'm almost 40!! So..........back when I taught Montessori before, I came up with this way to arrange map work so the children could be pretty independent. They WILL usually need help punching out their perforated continent. But otherwise, once taught the procedure, they should be pretty independent. Next, I want to comment on the pin-punching. 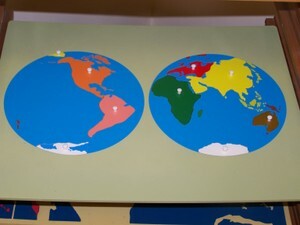 Some people may wonder why the children aren't allowed to use scissors to cut out the continents. 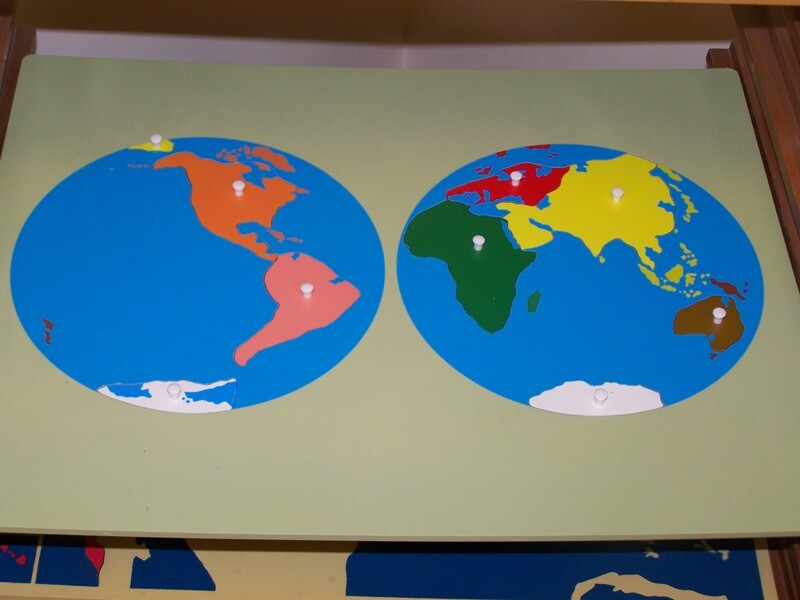 I clearly remember children in my previous Montessori classrooms who wanted to cut out the continents with scissors. Usually, it was because they wanted to get it done faster. To be honest, if they really wanted to do it that way, I let them. However, I ENCOURAGED them to do it with the pin puncher. Why? One reason is that the continents are very "bumpy" along the edges and most very young children would have a really hard time using scissors to cut around all the bumps. Another reason is that the pin-punching exercise is so good for developing concentration, attention to detail, and the fine motor skills needed for writing. So........that's my rationale for having them do it that way. And........the finished product looks so much nicer if they pin-punch. Finally, a word about the pin-punchers. The ones pictured above are different from what I used before. You can purchase punchers like that from Montessori Services (see my sidebar for the link). However, in my previous Montessori teaching situation, we used the VERY large push pins. Here is a link to what I'm talking about. These worked just fine. However, now that I have the ones I have I think I will like them better. I like that they are sized similarly to pencils in diameter. Therefore, the child will have to use a tripod grip to hold them, which is good practice for writing. I just wanted to point out the giant push pins as another option. I love your ideas and wish my kids could be in your class. I'll just try to copy you at home since we live a little far from you. My question has possibly already addressed and I missed it. Where did you get your continent outlines? I like it that they're less detailed and more the basic shape than what I have run across. Thank you and thank you for your efforts to those lucky families. Love this idea and I agree that yong students need to begin learning geography. I was wondering do you have a copy of the patterns or do you know where I could get a set? I will be honest I am not a very good artist.Your help will be greatly appreciated. What is the circle width size? That is a great variation. Thanks forcommenting. To add an extra step for my older kids, I only cut out the correct color squares. They trace the continent on their own and then punch. It's been amazing to watch. Ijust reread my post to try to determine what gave you the idea that I did not realize there are seven continents because I certainly do know that. I cant figure out what made you think that. Feel free to email me back with the specific words from the post that were not clear to you. Id appreciate it. I certainly would notwant others to conclude whatyou did. Thanks for your comment. If you are a teacher,then you should know there are seven continents in the world. North Pole is not a continent,and North and South America are two separate continents. When in doubt, google it. Hello. Can you pin punch well using construction paper? We have always used card stock, which gets $$$. I am abit confused with the continents, you have not mentioned the North Pole. Which Continent does this place fit in? Also I thought North and South America was counted as one continent is this not true? this sounds so good. i want to do this. At what age do you introduce pin punching? It sounds great, but I wonder if O is too young (24 months). What do you think? I do the same continent work and I always prepare the pre-traced continents. But for some reason I keep them in baggies on my shelf (high up)...DUH!!! I don't know why I never thought to put them on the shelf so the child can choose and punch independently. Thanks for the wake up call! We use the small regular size push pins and they work just fine! I have a tack punch #1 set on my PL shelf, a pre-requisite for tack punching a shape. I made a small (probably 3X5"?) page of circles, and the children place this on a mat, and they have a box of coloured tacks, enough of one colour to fill a row down (so 5-6 colours I think). The child simple pushed the tack into the centre of the circle, and leaves it there. When they are finished pushing all their tacks in, they remove them, and take the paper home. north and south, east and west, and all around the world. Australia, Antarctica and Europe as well"
The only problem is that they aren't actually saying North America. I love the Geography area. I have been working now on the area for the fall. I love recreating the globe bit by bit. Do you have them glue their blue circles on a large piece of construction paper & store it?? So when they are ready to move ahead they can find their globe & continue. I got an idea from Montessori for Everyone...I painted a box for each continent containing the punching, 3 part cards, & some small cultural items that the children can explore. Visually on the shelf it's attractive & I can't wait to see how the children will use it. Thanks again for great ideas!! !